Sarah McBride was born in England in 1966. After travelling extensively and bringing up a family she is now based in Bunbury, Western Australia. Sarah has now renewed her passion for art and paints full time. Sarah is a self taught artist. 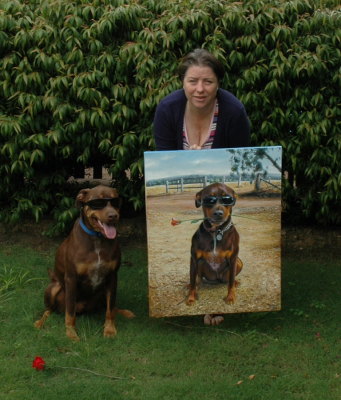 Sarah's specialises in portraits, whether it be animals or human subjects. She looks for the quirky, different and the unusual and has many fans of her work. In between portraits she loves to recreate some of the beautiful landscapes she saw on her travels. Sarah accepts commissions. Please contact her direct for further details.